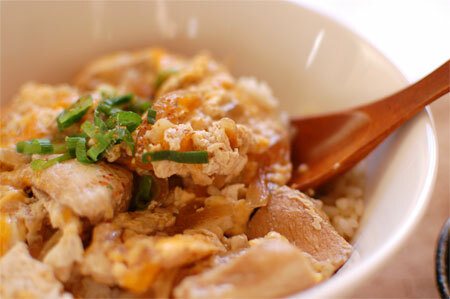 Besides the traditional Japanese food, there’re Western style food created by Japanese chefs in Japan. This cuisine is called “yo-shoku” (Japanese Style Western Food) and I had more chances to eat these yo-shoku dishes than traditional Japanese food when I was little. 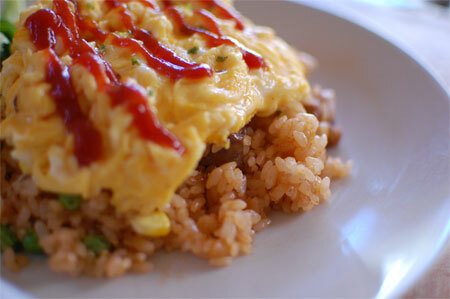 This dish “omu-rice” (omelet rice) is one of the popular yo-shoku dish in Japan, especially among kids. 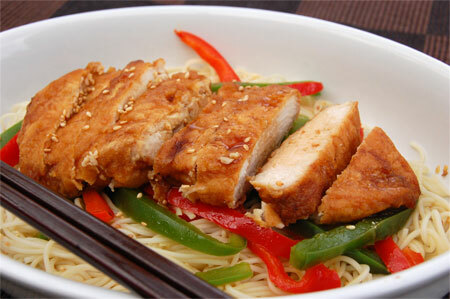 The rice is stir-fried with frozen mix vegetables and chicken pieces, usually flavored with tomato based sauce. 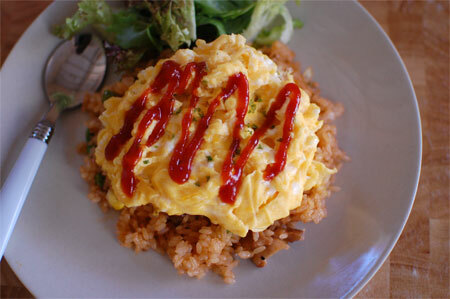 Normally the rice is wrapped with omelet completely (like you wrap something with plastic wrap), but placing omelet over the rice is much easier when making multiple omu-rice, and it tastes just as good as the wrapped one. Heat 1 tbs of oil in a frying pan over high heat. Grill chicken thigh pieces. Turn down the heat, and add onion. Saute until the onion is almost transparent. Turn up the heat again, and pour white wine. Simmer to reduce the liquid. Add cold rice. Using a wooden spatula, break the rice as you stir-fry. Add frozen vegetables, then mix through. Once the rice is all broken down and heated through, add tomato sauce and Worcestershire sauce. Mix through, and season with salt and pepper. Turn off the heat. Set aside. Break eggs into a medium bowl, and mix with milk and salt. Heat 1 tbs in another frying pan (clean). 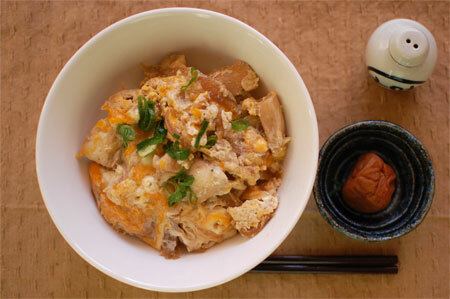 Once the oil is hot but not smoking, pour the egg mixture and stir with spatula or chopsticks to make soft scrambled eggs. 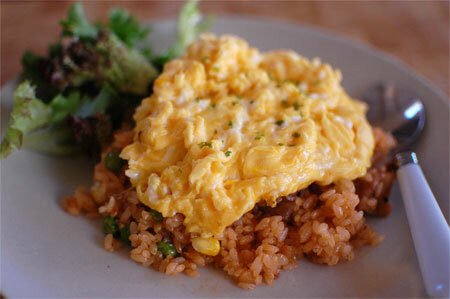 Divide the tomato rice into 4 serving plates, and top with scrambled eggs. 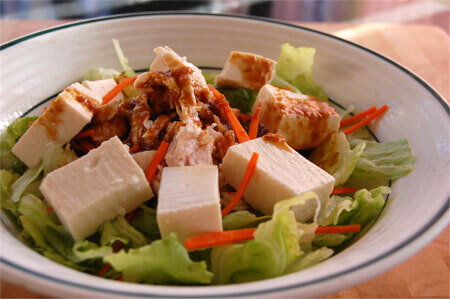 The dish Chicken Nanban was originally created in Kyushu island in Japan about 50 years ago. Since then, this item has became very popular across Japan, and now you can find the dish in family restaurants, convenience stores, fast food chains and even pizza shops. 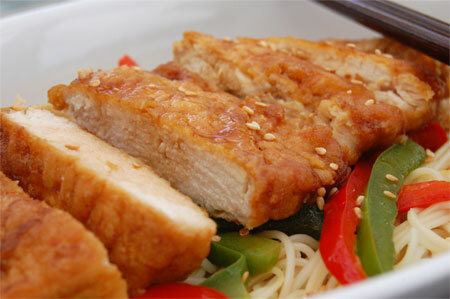 The original Chicken Nanban was a deep-fried chicken immersed in sweet/sour sauce. Nowadays Chichen Nanban is served with tartar sauce poured over the chicken, and it is still one of the popular menu for any age group. 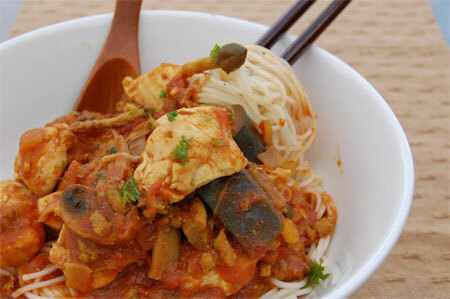 This is again another easy dish to cook, and it goes with both rice and noodle. Halve each chicken fillets into even size. You should have 4 slices. Flatten the chicken meat by using the back of the knife. 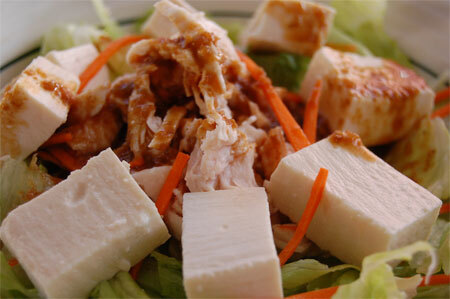 Place soy sauce, sugar and vinegar in a sauce pan, and bring to the gentle boil to dissolve the sugar. Transfer the sauce to the wide plate or pan. (or you can use wide pan to boil the sauce). Set aside. Coat the chicken with flour, and shake off any excess flour. Beat the egg, and place in a shallow plate. Heat oil in a deep frying pan. Dip the chicken fillets in the egg wash, and deep-fry both sides until golden. As soon as it’s removed from the oil, shake off any excess oil and immerse in the sauce. Leave it for 30 seconds ~ few minutes. Meanwhile, heat sesame oil and garlic slices in a frying pan. When it’s fragrant, add somen noodle and stir-fry. Sprinkle sesame seeds, and arrange on serving plates (divide into four potions). In the same pan, stir-fry sliced capsicum. Remove from the heat and arrange on each bed of somen noodle on the serving plates. Remove the chicken from the sauce, and slice. Place on top of the noodle + capsicum. Drizzle over the sauce, and sprinkle sesame seeds. Repeat with other fillets. * you can use steamed vegetables instead of capsicum. 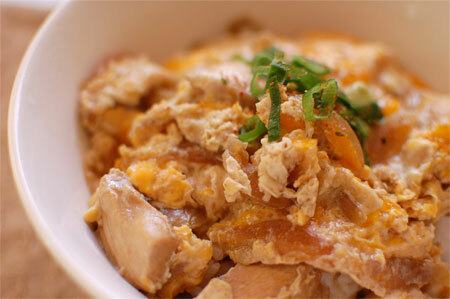 Tazta-age (tatsuta-age) is a kind of Kara-age. 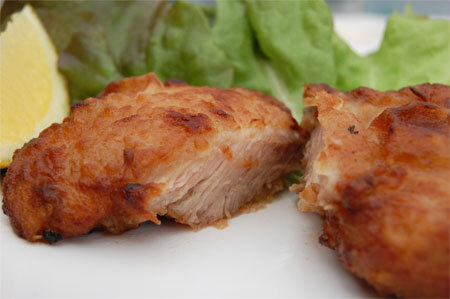 Kara-age is a deep-fried chicken (usually chicken thigh) coated with katakuriko (a starch originally processed from the corm of katakuri) and plain flour after being marinated with garlic and some spices. On the other hand, tazta-age is a deep-fried chicken (usually chicken thigh) coated with only katakuriko after being marinated with soy sauce and sweet mirin. You can use corn starch (corn flour) instead of katakuriko. The key to make juicy kara-age with crispy texture is the twice-deep-frying. You deep-fry the meat in low-temperatured oil first, then deep-fry again in very hot oil to shake off any excess fat and to make it crispy. Cut chicken into pieces. 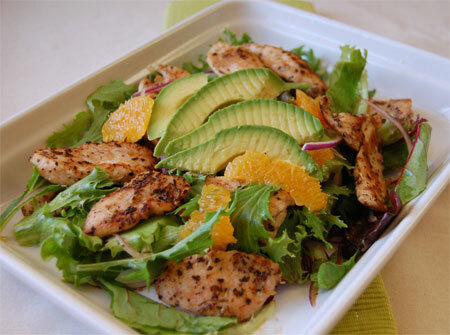 Trim chicken thigh into even thickness. Marinade in the sauce for 30 minutes. Drain the chicken. Heat the oil in a pan to 160°. 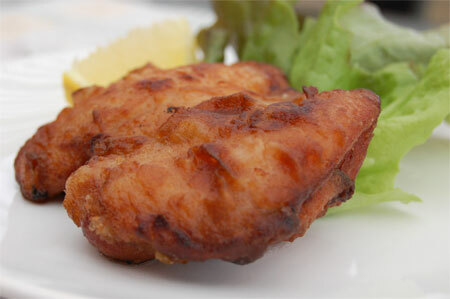 Coat the chicken with katakuriko, shake off any excess flour, and deep-fry both side until coloured. Set aside. Heat up the oil to 180°. Deep-fry the chicken pieces again both side until crispy. 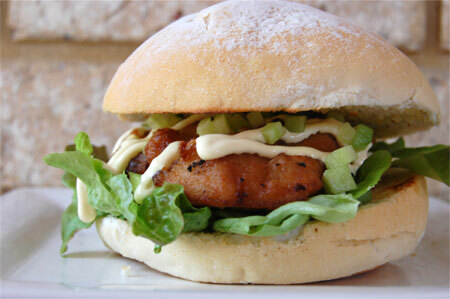 The best way to eat tazta-age is with Japanese mayonnaise! You can’t stop eating steamed rice with it. On your next bbq party, or whenever you feel like eating something on sticks, why not try this negima – Yakitori skewered with negi (spring onion). 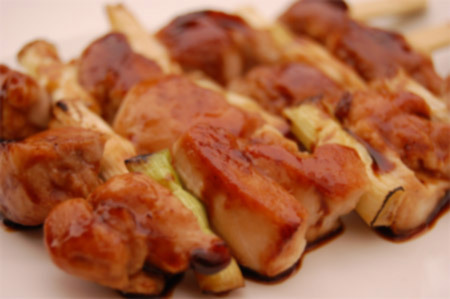 It is a very popular way of preparing yakitori and provides a great nutrition balance. 😀 We normally use white part of spring onion for this. White part of spring onion is sweeter than blue part and contains the flavorsome juice – umami. You’d better soak bamboo skewers in water overnight to prevent them from burning. And also, you can prepare the sauce the day before, as it will develop the flavor in the sauce. Skewer chicken and onion alternately. Tuck the tip of the skewer with meat so it won’t burn. Heat and lightly grease a BBQ grill or a large grilling pan. Season the skewers with salt, then sear on the hot grill. Cook for 1~2 minutes, turning several times. Brush the meat with the sauce, then continue grilling, turning frequently. Repeat the process (brush and grill) for about 5 minutes. Serve while hot with steamed rice, or a glass of beer. 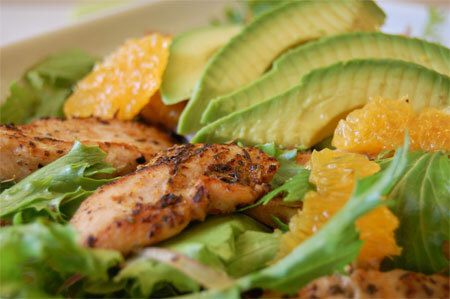 One of my favorite dinner dish. 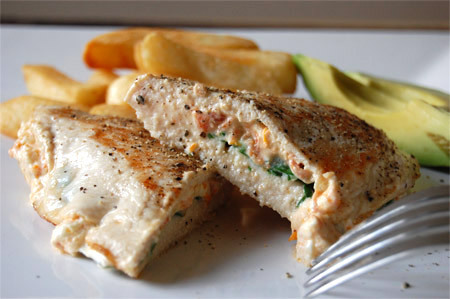 Full flavor of semi-dried tomato and cream cheese in a pocket of chicken breast fillet. The key is to season the meat well before grilling. Chop semi-dried tomato, and combine with cream cheese. Halve the chicken breast in sideway to make two thin fillets. Cut the centre of each fillet to make a “pocket”. Season the inside of the pocket with salt, and then spread the cream cheese mixture inside. Arrange spinach on top and then close the hole by lightly pressing the top side of meat to the bottom. You can use toothpick if needed. Heat 1 tbs of olive oil, and grill top side first. When colored, flip it around and cook the other side over low heat. Once the meat is cooked through, remove from the pan and rest for a while before cutting. Garnish with cracked black pepper.